Some stunning batting from Steven Crook and Rory Kleinveldt helped Northants Steelbacks claim a dramatic two-run win at Worcestershire Rapids on Friday night. They smashed 60 runs from the final 15 balls, with Kleinveldt rifling an incredible six sixes in the space of seven deliveries. 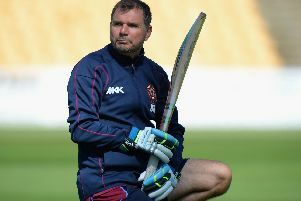 That dragged the Steelbacks to 193 for eight, with the Rapids facing a real task to extend their four-match T20 winning streak against David Ripley’s men. Their cause was helped by an ankle injury to England star David Willey, who had collided with Jack Shantry on his way to hammering 31 runs from 12 balls in the Steelbacks innings. Willey was unable to bowl and immediately headed back to Northampton for a scan, meaning he is now a real doubt for the trip to Nottinghamshire Outlaws on Saturday. But the Steelbacks got the job done in his absence, with Kleinveldt the star man, claiming two for 25, including the wicket of England’s Moeen Ali, who was out first ball. Middle-order batsman Ross Whiteley had steadied the sinking Rapids ship with an unbeaten 41, but it wasn’t to be enough. Muhammad Azharullah kept his nerve, ensuring the 14 runs needed from the final over was too steep for the Rapids, who were edged out. It meant the Steelbacks ended their barren run against Worcestershire and moved right into contention in the North Group. Northants had been confident heading into the game, especially with Willey back in the ranks after his impressive performances for England. He started well, plundering 31 as he opened alongside Richard Levi. Levi was dismissed for 19 by Jack Shantry before Willey was caught by the same player off the bowling of Saeed Ajmal. The Steelbacks were starting to slip as Josh Cobb was run out by Brett D’Oliveira for just two, but their run rate was still impressive. Ben Duckett and Alex Wakely were tasked with restoring order after a couple of quick wickets, but Duckett skied one to Daryl Mitchell off D’Oliveira for seven. At the halfway stage, the Steelbacks were 84 for four, with Wakely and Crook ticking along nicely. Wakely was caught by Whiteley to present Ajmal with his second wicket, before two quickfire dismissals. Adam Rossington departed for just six after being caught in the deep, before Rob Keogh was run out for one. Crook and Kleinveldt teamed up to devastating effect, hauling the Steelbacks to a big total by the scruff of the neck. Kleinveldt was particularly damaging to the Rapids attack and he soon turned hero with the ball. The big South African dismissed Ali with his first ball, with Keogh taking the catch. Mitchell and Tom Kohler-Cadmore ensured there would be no more early agony as they teamed up to take the Rapids to 75 for one before the latter departed. Mitchell was gone seven runs later as Cobb, who had trapped Kohler-Cadmore LBW, ran him out. Graeme White got in on the act as he took the catch off his own bowling to dismiss D’Oliveira, but Colin Munro was still there. He hit 33 from 20 before Keogh showed safe hands to ensure he exited the middle off the bowling of Azharullah. That gave Whiteley and Ben Cox a real job to do, but they were showing composure until Kleinveldt came up trumps again, having Cox caught by Azharullah. The Rapids, with four wickets remaining, needed 14 from the final over to win, just as Lancashire Lightning had against the Steelbacks seven days earlier. On that occasion, Azharullah kept his cool, and he did it again at New Road, ensuring Whiteley could not claim the points for the home team.